How did they understand the concept of Cuba as “medical superpower” born of the highest echelons of the Cuban government? Obviously, the top leaders of the country, who are native to the region, inflated one of the many balloons have gone flat since 2006, the year that the historic leader abdicated due to illness in favor of his brother. If Santiago de Cuba is located 540 miles from Havana: will the 148 beds be enough to serve tens of thousands of patients a year in that and other neighboring provinces? Why didn’t this regime build a new cancer hospital for the region? The main photo accompanying the article shows us the facade of a very nice center that resembles Joaquin Albarran Hospital in Havana hospital and quotes, from the lips of Dr. Rafael Neyra, that “for the first time in the hospital’s history they can count on basic measures and specialized personal to care for patients with major surgery or complications.” What range of care and services did they pay for before? Did they send these cases to Havana, far from their families and usual environment? What type and generation of equipment did they have? 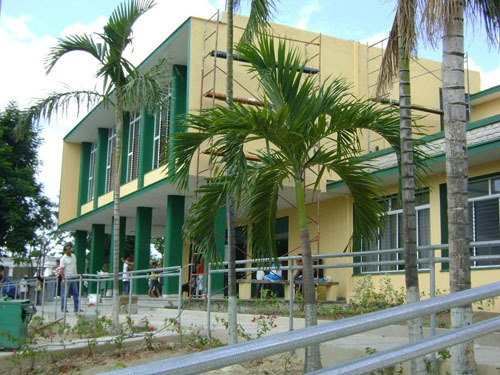 All of the good now, of the health center, and the excellence of the final product that the commentary speaks of, passes through the timidity of the concept of journalism and Cubans in general, about what should be the comfort and quality of services they can expect from a hospital. The so-called free public health is a falsehood that we pay for with decades of inadequate salaries and with the appropriation by the government of the output of the workers; and still they offer us bad medical care — many times in ruined buildings with material shortages of every kind — bad hygiene and inadequate medications for the recovery of the health and quality of life of many patients. To assess if, indeed, the installation offers proper comfort and primary care, as advocated in the report, we would have to know, by way of contrast, the hospital facilities where the leaders of the country and their family and friends and foreigners are cared for; or better yet, to enjoy the same benefits — why not? — as those who plan our lives with a false paternalistic mentality. We need new government and general administrative visions and projections and this is achieved by abandoning the old conceptions and structures that led to the financial ruin that is now Cuba. To achieve this we must go to the root of the problems without hesitation or fears, with political pluralism, with freedom of speech and of the press, and a set of laws that protect, defend and guarantee. We will achieve this with changes, not with simple structural restorations that represent on a mocking smile at an inefficient and unproductive dictatorship.